Bellator 157: Rampage Defeats Ishii and Michael Chandler Claims Vacant Lightweight Championship Belt (photos) » MMA H.E.A.T. In a highly-competitive heavyweight main event at “Bellator: Dynamite 2,” “Rampage” Jackson (37-11) edged out Satoshi Ishii (14-6-1) with a split decision victory (30-27, 28-29, 29-28) on Friday night inside Scottrade Center during an event that aired LIVE and FREE on SPIKE. 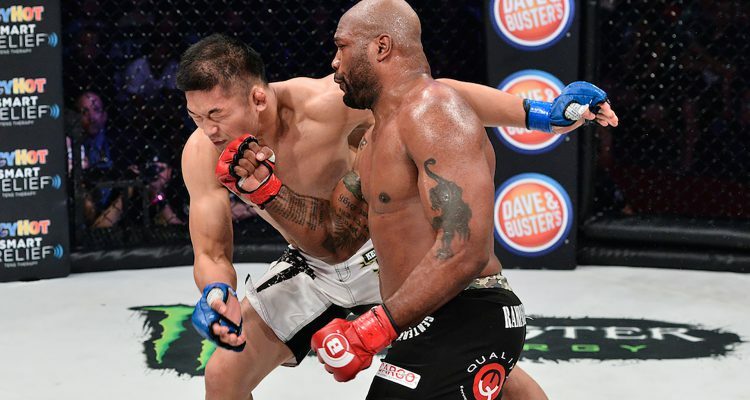 With the win, “Rampage” extends his current winning streak to five, proving once again why he is one of the most dangerous athletes on Bellator MMA’s roster. Jackson also improves his promotional mark to an undefeated 4-0, with multiple wins coming via first round knockout. After the fight, “Rampage” made it clear he intends on returning to action sooner, rather than later. “I’m going to go home to Orange County, take a little vacation, then come back bigger and better than ever,” Rampage said. Missouri’s own “Iron” Michael Chandler (15-3) gave his hometown fans exactly what they came for, reclaiming the vacant lightweight belt with a ferocious first-round knockout punch. The new 155-pound kingpin finished Patricky “Pitbull” Freire (16-8) just 2:14 into the evening’s co-main event, giving him six total knockouts during his seven-year professional career. The loss is the eighth of “Pitbull’s” illustrious career and puts an abrupt end to his recent string of two consecutive victories. After the win, Chandler stuck a backflip in the center of the cage as St. Louis Cardinal’s legend Ozzie Smith looked on, emulating the famous celebration Smith made famous during his MLB career. In the second MMA battle of the evening, Ilima-Lei MacFarlane (4-0) was able to continue her rapid ascension to the top of the women’s flyweight division and remain undefeated with an impressive rear-naked choke submission over Rebecca Ruth (6-2). MacFarlane’s remarkable ground game and jiu-jitsu skill set was on full display tonight, forcing the veteran Ruth to tap out three minutes into the second round. For Ruth, the loss is just the second of her career and first since 2014. The win is “The Ilimanator’s” third since joining the promotion and is her first submission victory of the rear-naked choke variety. In the opening kickboxing bout of “Bellator: Dynamite 2,” Gloria Peritore (11-1-1) was able to edge out Denise Kielholtz (44-3), taking home a split decision victory. It was an even battle from start to finish, but in the end it was the judges’ scorecards that read 29-28, 28-29, 29-28 in favor of the Italian. The loss is just the third of Kielholtz’s career and left the Dutch powerhouse completely speechless in the center of the ring. For the 27-year-old Peritore, the win gives her 11 since making her professional debut only two years ago. Matt Mitrione (10-5) was able to absorb an early blow from Carl Seumanutafa (10-7) just 20 seconds into round one and answered with a flash of brilliance 3:22 into the opening frame. The come-from-behind knockout victory is the ninth of that variety and tenth of Mitrione’s career. “Meathead” proved his ability to outlast yet another opponent in what will surely go down as one of the greatest Bellator MMA debuts of all time. Now, Mitrione sets his sights on returning to the cage as quickly as possible, with the goal of winning Bellator gold on his mind. No Comments on "Bellator 157: Rampage Defeats Ishii and Michael Chandler Claims Vacant Lightweight Championship Belt (photos)"